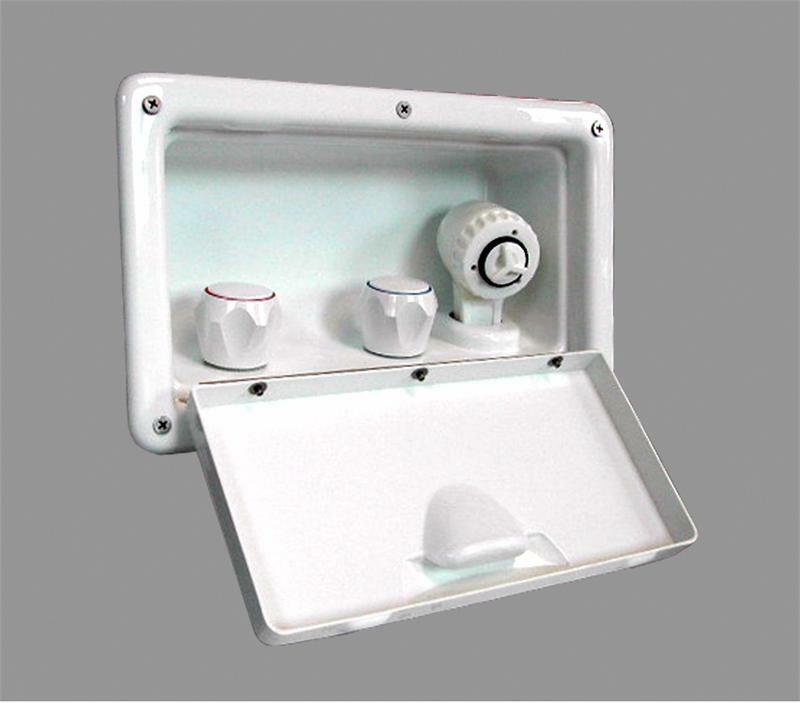 This transom shower features a high-gloss white acrylic capped ABS housing and door. The door has an extremely durable stainless steel hinge, molded handle, and twin latches that keep it rattle free. It should be mounted horizontally to allow the hose to hang when stored. The maintenance free hot/cold mixer has white knobs with red & blue rings. The white shower wand can be set to shower or massage and is attached to a 10' white hose. Overall housing dimensions are 12-1/4"W x 7-1/4"H.
The cut out is 10-3/4"W x 5-3/4"H.
You'll only need 3-1/2" of depth behind it, but you will need 7-8" of clearance below the back side to allow for the wand & hose. Water connections are standard 1/2" male threads.